Emotional Support Animals are beneficial anxiety coping tool for many people struggling with grief, depression, or other difficult situations. For an animal to be recognized as an ESA, a physician must provide an ESA prescription that confirms your mental or emotional illness and states that you could benefit from an ESA. One of these letters must be solidified by your mental health professional or a doctor. That you are a current patient of the mental health professional or doctor who certified your mental disability in the ESA letter. That you are under a care plan provided by the doctor or mental care professional who provided you with the ESA letter. That your emotional difficulties keep you from being able to participate in at least one regular daily activity. Your ESA letter should also state that a support animal is a component of your ongoing treatment plan and that its companionship will help you cope with the difficulties you face in your daily life. Additionally, your treating physician should specifically state how the support animal will help with your prescription and include your name as well as details about your pet. For example, your physician may want to include the type of animal you have, its name, breed, etc. to enhance the legitimacy of your ESA letter. For those wondering how to deal with anxiety who also believe an ESA could help them with the struggles they face, they must remember that these letters are only valid for a 12-month period following the day they are obtained from their healthcare professional. Just like no prescription for a medication lasts forever, neither does an ESA letter. There are many reasons why you should renew your ESA letter after it expires. For example, if your ESA animal lives with you in a rental property, you must possess this letter to maintain your right to have the animal with you. If you decide to travel and need to take your support animal on a plane, the date on your ESA letter will be one of the first things the airline checks for when you hand over this documentation. Without a valid letter, you may be required to pay a pet fee or asked to store your pet in the luggage compartment beneath the aircraft. Without this letter, you may even be asked to leave your support animal behind. Since many people desire the companionship of an ESA, some try to take advantage of these unsuspecting pet owners. 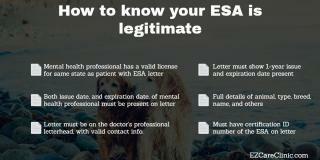 A quick internet search will bring up hundreds of websites that claim they offer legitimate ESA letters, but when it comes down to it, are nothing more than a scam. As a result, many people have reported securing an ESA letter online only to find out later that it was fake and they wasted their time and money. If you are already receiving treatment from a physician or mental health professional, explain your situation to them and go over why you think an ESA may help. After this, your treating physician can help you determine if your condition qualifies for a support animal and move through the steps needed to secure an ESA letter. If your ESA letter has expired or is about to expire, don’t be tempted to go to a shady online source to renew your letter. The doctors at EZCare Clinic in San Francisco can issue your Emotional Support Animal letter fast. Call (415) 966-0848 or schedule an appointment online to find out more about renewing your ESA letter. Without a valid ESA letter, you may have a hard time maintaining the validity of your ESA and may run into issues when you try to bring it with you places. We can help you know when to update your ESA letter online and at our clinic in San Francisco and can help you ensure that this letter is always valid, so you never risk losing the assistance of your support animal.